As you know, we can not play the DVDs directly on the tablet without DVD drive. Now, there is a powerful software through a few simple conversion and achieve this goal. It’s Pavtube DVDAID, is the best DVD converter for Kindle Fire, Kindle Fire HD/HDX, you can easily convert and convert any DVDs homemade or commercial to Kindle Fire or Kindle Fire HD/HDX MP4 H264, HD video format. And the powerful editing feature, such as cropping frame size, trimming duration, adding image/text watermark and setting effect on windows all windows OS. The quick start guide below uses DVDAID Windows screenshots. The way to rip DVD movies to Kindle Fire tablets series on Mac is almost the same. Just make sure you get the right version according to your computer’s operating system. Step 1. Launch the top DVDAID for Kindle Fire tablets, Put the DVD in DVD drive first, and then click the “DVD disc” icon to navigate to the videos you want to convert. 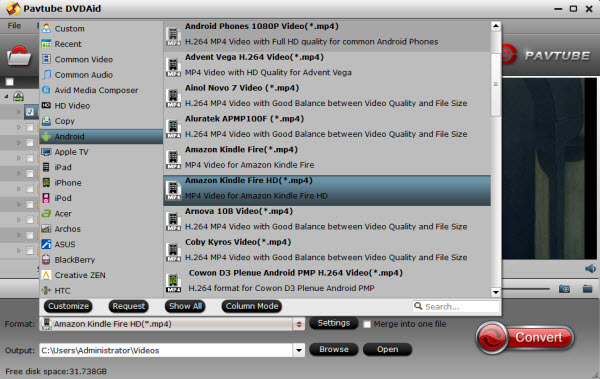 You can also add DVD disc, ISO file, IFO file or DVD folder. Step 2. Choose the output format for playback on your Kindle Fire HDX. You can get optimized videos for Kindle Fire HDX under Format > Android > Amazon Kindle Fire HD H.264(*.mp4). 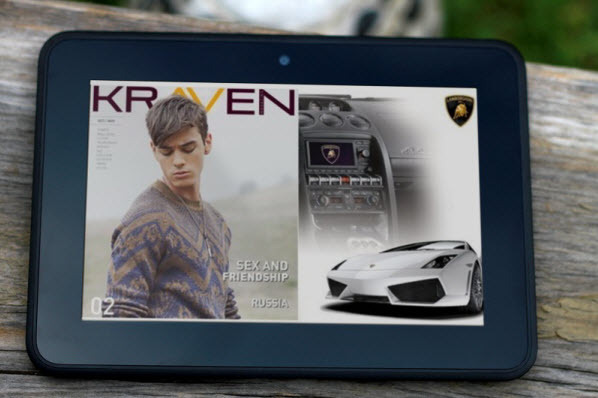 The output videos could also fit on your Kindle Fire tablets devices perfectly. You can also click “Settings” to change the video encoder, frame rate, resolution, etc. Step 3. Press the “Convert” button to start the conversion. It will not take much time. Just wait for the conversion process to get done. Tips: Before the conversion, you can click “Edit” button to edit your videos by cropping, trimming, adding watermarks, etc. What’s more, you can choose the subtitles and audio track for the target video on the main interface.